“On Air – Servus India” is the slogan of the binational radio project organized by the headquarters of the Goethe-Institute in cooperation with the Max-Mueller-Bhavan in Delhi. Clara Schaksmeier, SCHULWÄRTS!-Alumna, is the committed organizer of the project. Thanks to her devotion a number of 22 teenagers, six German and 16 Indian students, stay from 31st of October until 5th of November 2016 in the youth hostel Possenhofen near the Starnberger Lake. 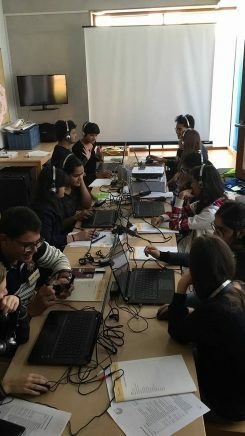 Here, the students get the unique chance to explore radio broadcasts for a whole week via a fascinating variety of different methods and approaches. Far away from all the noise of the Indian and German urban areas, close to the estates around the Starnberger Lake, sits the youth hostel Possenhofen. The location offers very modern and light rooms for the step by step arriving adolescents from Bavaria, Baden-Wuerttemberg and metro Delhi, Mumbai, Pune, and Kolkata. After obtaining the keys to the rooms, the students fill their stomachs with a rich typical German dinner and start a lively social gathering in one of the seminar rooms. This meeting is characteristic for the Youth Exchange. Contrary to the assumption, that the Indian students – between 15 and 18 years old – would need some time to get used to the new surroundings, they immediately start interesting conversations and discussions between both nations. A big thanks goes out to the teamers of the radio project – Karolina Greil, Merve Navruz, Lisa Pelkner and Matthias Posch. They succeeded – right from the start – in bringing together and motivating the students to start conversations with each other. The task for the expert of the workshop is not easy: He needs to instruct an interculturally mediating radio project. Andreas Meske and his team, Jessica Schäfers und Rebecca Wasinski, manage to do all that perfectly the next day. In very funny ways they introduce the young radio stars to the different work fields of radio broadcasting and arouse enthusiasm in producing individual radio features. Thereafter, the students explore in small, binational reporter teams the area in and around the youth hostel in Possenhofen, walk to Pöcking or to the Starnberger Lake in order to produce spontaneous short interviews on regional topics in German. © Tobias Trutz Afterwards, all the participants go to a sound studio which is installed in one of the rooms of the hostel. After a short theoretic introduction they start cutting and editing their audio files. With a lot of devotion, they reduce the number of “ehms” and “ehs”, shorten the segments, and level the volume. After a night that is very demanding for some of the groups as they are post editing their interviews everybody can listen to the fascinating quality of the results. The creativity is absolutely astonishing. Sometimes the students ask their interview partners about important Indian festivities, then about the differences and similarities between Germany and India or Indian food. It is big fun to learn about the respective other culture and to use the German language via this methodical approach. As every good radio feature needs a suitable jingle, the students start to collect suitable ideas for a title of the project first and vote with one voice for “On Air. Servus India.” in the end. Thereafter, they roam around using their sound recorders, record short voice snippets and set the footage to Indian and German sound-effects and music. The Jingles sound magnificent and are in no way inferior to the ones of German and Indian radio broadcasters. The day before departure, the participants of the project visit Munich. In the morning, the private radio broadcaster “Gong!” invites the 22 students to take a look behind the scenes of a radio station. The rooms are quite impressive especially by the time the students are allowed to attend a live broadcast of the channel. Then, the participants explore Munich city, go shopping for presents to take home with them – gummy bears are very popular – and enjoy the beautiful sights. In the evening, they take part in a wonderful and communicative programme, playing “Cards Against Humanity” and “Werewolves of Miller’s Hollow” until they have to say goodbye to each other the next morning. After a couple of discussions about the planned interview projects that follow the exchange programme in Germany, a couple of participants shed a tear of goodbye. After a week full of joy and friendship they hug each other, exchange telephone numbers and email addresses, and promise each other an early reunion. Obviously, the project manages to do what people expect from exchange programmes: Understanding among nations across language borders, continents and cultures. Bravo!